Baseball is America’s pastime, even in the Northern Mexico part of the Americas. 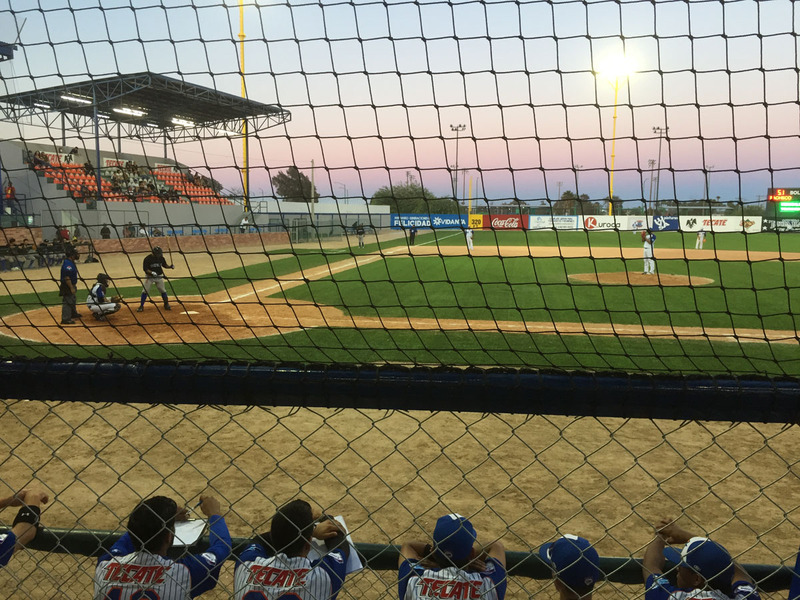 There are two weekends and six games of baseball left in the Puerto Peñasco Tiburones’ 2017 season – June 30, July 1 and 2 and the following weekend, July 7, 8 and 9. They’ll be playing the Freseros De San Quintín. If you can swing it, treat yourself to a game. You’ll have a ball. We popped for front-row seats right behind the Tiburones’ dugout, which set us back 100 pesos (roughly $5) each. Ice-cold beer and soda is brought right to your seat for just 20 pesos a beer and 10 pesos for soda or water. A hot dog with fries was 45 pesos; but it’s not just about the bargains. This is first-rate, minor-league baseball. The Tiburones have been around since 1960. They are part of the Liga Norte de México, a minor-league for the Mexican Baseball League which is a class Triple-A league in organized Minor League Baseball, one grade below Major League Baseball. Though these leagues are not affiliated with major league teams, it is not unheard of for scouts to monitor these teams for rising stars. The game we attended was a shut-out until the eighth inning and enthusiasm couldn’t have been higher among the home-team fans. The newly refurbished stadium seats 1,860 plus about 55 in the sports bar/restaurant next to the announcers’ station. It’s a beautiful, well-lighted field. There’s a high-tech scoreboard, the traditional crowd-rousing musical fanfare from the announcer’s booth, and plenty of cheering from home-team fans. The stadium was named for Francisco León Garcia, a local baseball enthusiast who was a driving force in promoting baseball in Peñasco, garnering sponsors, promoting attendance and development of playing fields. Parking spots are somewhat scarce if the stadium is full. We found a spot right between the stadium and the park but were later advised that it’s the foul-ball-through-your-windshield zone. We were lucky, but you decide! The season runs from April into July and longer if there are play-off games. It really is a great evening of quality baseball – America’s pastime on both sides of the border. If you’re in town, don’t miss it! Yandry Preciado, age 2, has ball and glove in hand as he looks over his Tiburones in the dugout at a recent game. Yandry, the son of Caroly Lopez, paced the fence, watching the game and fist-bumping other fans when the team scored. 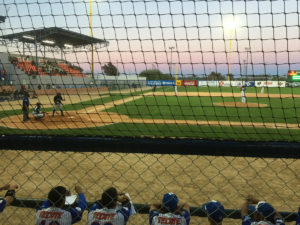 The newly refurbished stadium in Puerto Peñasco is clean, comfortable and thoroughly high-tech. Six games remain and VIP tickets are just 100 pesos each.